Ocean-themed weddings draw on the beauty and magnificence of the water to create a unique and memorable day. This type of wedding theme also offers flexibility with colors and decorations, making it simpler and cheaper to get ready for your exciting event. The colors you select can be used in your save-the-dates, invitations, programs, and even your thank you notes. Coordinate with some graphics, like seahorses, shells, and rolling waves, to complete the theme. When it comes to selecting ocean and beach bridesmaid dresses, you'll want something that fits your aesthetic. 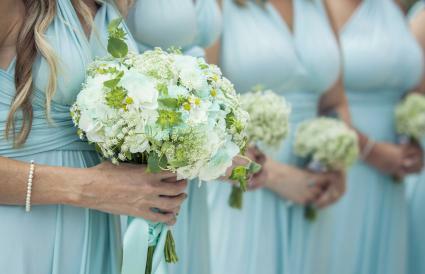 For a calm, laid back ceremony, pick out shades of blues and greens. Aqua, turquoise, and teal, or even a combination, look great. Then select flowers that pop against the cool ocean blues of the gowns. Alternatively, pick out bright pink, coral, or teal gowns, and pair them with white and cream bouquets or even blue wedding flowers. Match the men's vests to the ladies' gowns. The ceremony itself can be as simple and rustic or as elegant and elaborate as you desire. Most ocean-themed wedding ceremonies are located on a beach, park, patio, lawn, or dock overlooking the ocean. 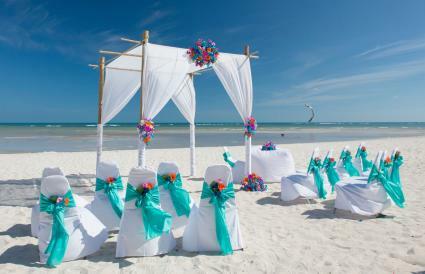 Cover chairs for a classy beach wedding look near the ocean and add blue or turquoise fabric to suggest a pop of color. A bridal arch can be decorated with white fabric and bright pink, blue, orange, and purple tropical flowers. A unique way to work an ocean theme into your ceremony is to do a symbolic sand ceremony in which both the bride and groom pour vases of sand into one large vase. Use varying colors to create a beautiful sand keepsake for your future home. Additionally, use ocean and beach themed accessories for your wedding, even if it isn't at the actual ocean. For example, skip the ring bearer pillow and have the child walk down the aisle carrying a ring bearer pail instead. The flower girl and ring bearer could also carry conches. Add a bit of levity by donning sunglasses through the ceremony. 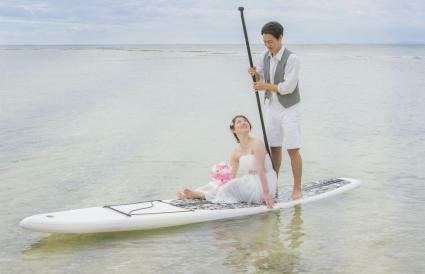 In fact, you could even make your entrance or exit as husband and wife on a surf or paddle board. Take advantage of the location! Decorating the reception is a huge part of the wedding. 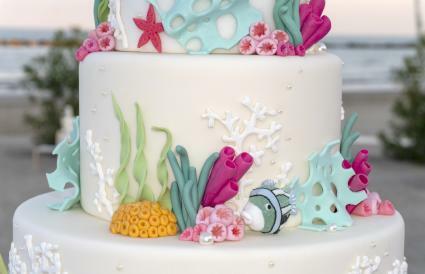 Couples who are planning an ocean-themed wedding but aren't seaside will find their theme come to life at the reception. 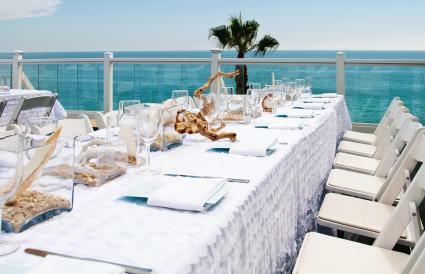 At receptions on the beach, you'll want to set up the reception so guests have a view of the ocean. 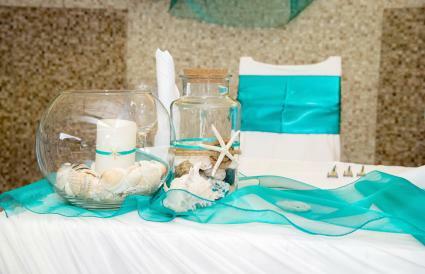 Many beach wedding decorations are suitable for use at an ocean-themed wedding. The table itself should be set with your colors in mind, whether you went with cool blues or bright corals. 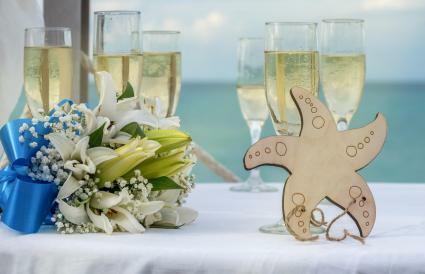 Add reception centerpieces that include sand anchoring starfish, candles, shells, and even driftwood. Tying a fabric bow around your chairs complete the look. Have your place cards do double-duty as favors. Select an iconic image, like star fish or sea horse, and purchase plain wooden ornaments. Add the table assignment to one side and your monogram and the date to the other side. Décor isn't the only area in which you can incorporate your ocean theme. Your reception meal can also be influenced by your theme. 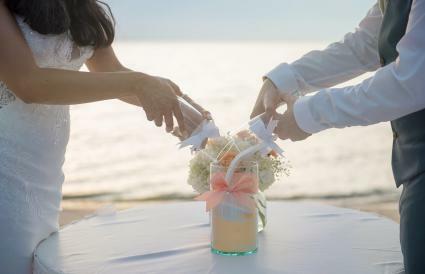 Pick out a menu for your beach wedding by the ocean that reflects the theme. Serve tilapia as one of the entree options and make sure you keep salads fresh, incorporating citrus fruits into them for a pop of flavor and color. Avoid heavy sauces and sides. The cake you select might be a seashell cake or it may be an ombre blue design on a simple three tier cake. Classic white cakes with coral and seaweed is another design option. Marine life, such as sea horses or star fish, can also be added to your design. Work with your baker to come up with a design that's elegant enough for a wedding but still suitable for your ocean theme. 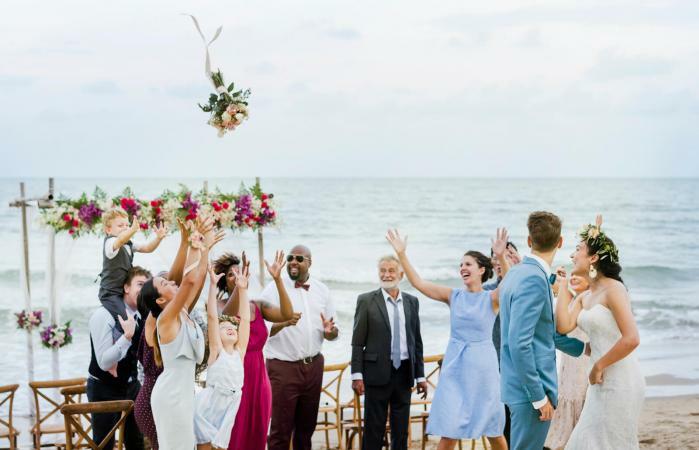 There are many ways to work an ocean theme into your wedding whether you use the colors for your dresses, have a ceremony that reflects the ocean theme, decorate with inspirations from sand and sea, or feature a sea-themed meal.